We were docked at the Tilghman Island Inn by 2 pm. That wasn't exactly where I had been planning to tie up, somehow confusing the Tilghman Island Inn with the Inn at Knapp Narrows. But it looked like a nice place with a great restaurant so we decided to stay there. 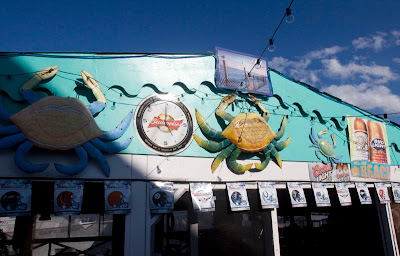 After we got our gear off the boat and sorted out we walked a few blocks to Harrison's Chesapeake House, a legendary inn, restaurant and sportfishing center on the south side of Dogwood Harbor. 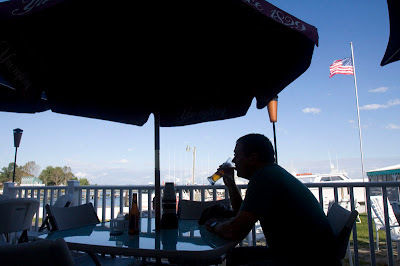 It was quiet when we stopped in for a beer, but I could tell that during summer weekends it is a hopping place. Initial reaction - deep fried. First bite - backfin crabmeat (the small bits of meat, as opposed to the large chunks of "lump" crabmeat) - gooey texture. Pickle (????) Heavy on the mayo to hold it together. Not impressed. 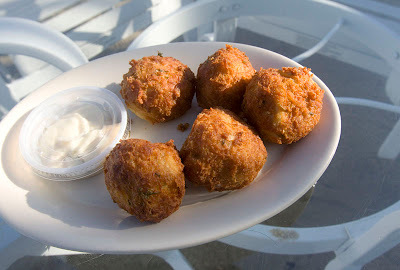 I would rate those crab cakes as "tourist" crab cakes. But the beer was cold and the view was very nice so we had a nice time. 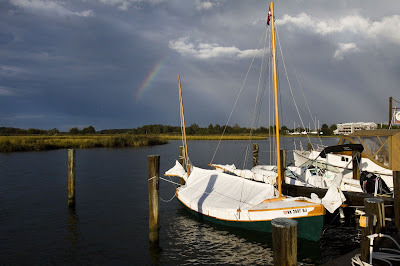 Dogwood Harbor is the home of the working Skipjack fleet, old Chesapeake Bay boats that dredged for oyster under sail. 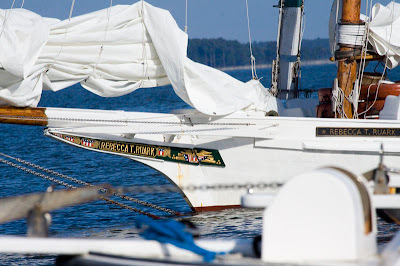 We watched the Rebecca T. Ruark come in to the harbor with some sightseers on board. I got the feeling that the Skipjacks spend a couple of months oystering but really survive by taking passengers out on daysails. If so that is fine. Whatever it takes to keep those classic old boats sailing is fine with me. It must be a thrill to sail on one, I know I enjoyed just watching one from a distance. 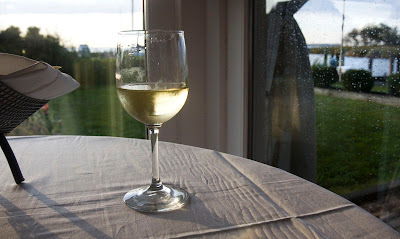 We got back to the Tilghman Island Inn just before a thunderstorm hit. Afterward there was a nice rainbow behind Spartina. We did have an excellent dinner that night at the inn. One of the partners is also the executive chef and the food was fantastic. I don't recall what Bruce had for dinner, but I had a bouillabaisse with mussels, scallops and shrimp. After dinner we were sitting in the lounge watching football and having a beer when a man walked in and asked the inn's owner "Who has that little sailboat out there?" The owner motioned towards us and the man came over and said "That is a beautiful little sailboat. I don't know how far out I would take her, but she is very nice." When I told him we had sailed in from Crisfield by way of Smith Island and Punch Island Creek he said "Really? ", shook his head and walked away.